It is located at 3371 Needham Avenue, just north of Wall Lake (which is 1/2 mile south off Highway 71 at HWY 36) and employ 3 at the Wall Lake location. 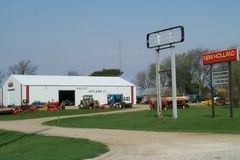 This business has provided outstanding service for all agricultural and light industrial needs since 1980. They are a fully contracted dealer for New Holland and they service and sell used equipment with a Full Service Shop and Parts Department on site for any of your equipment repair needs. You will find a full line of rental equipment including: New Holland equipment, as well as Bobcat skid loaders — and their attachments — when you visit their Wall Lake location. We also carry a full line of Echo Lawncare Equipment,for Sales, Services, any of your parts, and repair needs. The personnel in their Sales, Service and Parts Departments are knowledgeable and always willing to “Go the Extra Mile”. Please be sure to stop by Haley Equipment.